It’s that time again. The time for the nation to sound a collective sigh of relief as the winter finally decides to stop making our lives miserable and the spring comes racing gallantly to our rescue, ready to embrace us in all its warmth and glory. 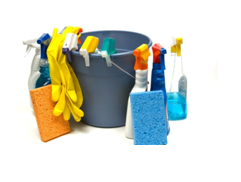 The arrival of spring usually means one thing for many people; spring cleaning time! We all want our home and garden to look their very best during the warmer months, so here are 6 fantastic spring cleaning products to help get you on your way. Getting your floors clean is a major part of the spring cleaning process. Unlike other vacuum cleaners, the Dyson DC33 uses Root Cyclone™ technology, meaning you won’t lose suction over time. You can clean all floor types with the DC33, so you’re not limited to just cleaning carpets. They really are the best vacuums around! Steam mops and fancy vacuum cleaners are great for spring cleaning, but sometimes all you need is a traditional cloth or duster! 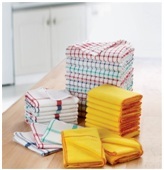 This handy bumper pack contains 10 dusters, 10 dishcloths and 10 tea towels, giving you all the basic essentials you’ll need to help you get started with your spring cleaning. Over the winter, your decking can appear aged and dull due to the battering it’s received from the harsh weather. By using a pressure washer to clean your decking, you can remove mould and built-up dirt to make the word appear new. Remove the grill plate from your BBQ and give it a good blast with your pressure washer to remove any dirt or grease. This will give you a healthier surface to cook your food on and reduce the risk of food poisoning. Patio furniture is prone to picking up dirt and mould, whether you store it in a shed or not. You can keep your outdoor furniture looking fresh and new by giving it a good wash down with a pressure washer every now and then. Everybody knows about the awful smells that wheelie bins can produce, especially in the warmer months. By blasting the inside of your bin with a pressure washer, you can get rid of most of the smell and reduce the risk of your bin becoming a breeding ground for animals and insects. Why pay a window cleaner when you can do the job yourself? With this 16ft 4” brush, you can easily clean the top windows of your house, the conservatory roof and even the guttering. The brush comes equipped with a sponged mop head and a microfiber cleaning cloth. The handle is made up of 6 rods, which allows you to adjust the length of the brush accordingly. For removing stubborn dirt and grease in smaller, more confined areas, you can’t beat a handheld steam cleaner. They’re fantastic for cleaning hobs, clothing, toilet bowls, grouting in bathrooms and even windows. 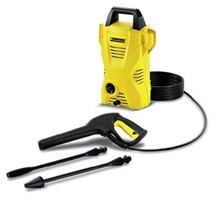 Most of our steam cleaner packages come with added accessories such as window squeegees and garment steamers to make your spring cleaning experience an even simpler one. Generally, handheld steam cleaners do not use chemicals, only water, making them much safer to use than other cleaning products.